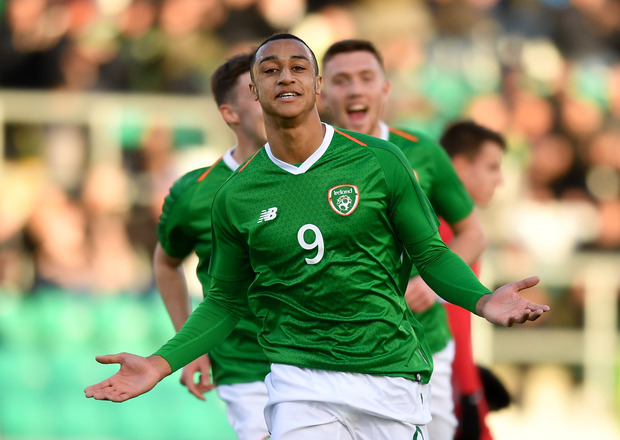 Adam Idah’s brace on his U21 debut helped Ireland begin the Stephen Kenny era with a fully-deserved victory over Luxembourg at Tallaght Stadium in their opening Euro 2021 qualifier. Following a cagey opening, Ireland scored twice in four minutes through Idah and Neil Farrugia to take full control before the Norwich City teen notched his second on 68 minutes. Kenny won’t see out this campaign as he’ll be on senior duty by the summer of 2020 but he provided a glimpse of his philosophy by sending his team, featuring three starters from League of Ireland clubs, out to attack from the outset. They are next in action at the Toulon friendly tournament in July before resuming their competitive campaign by welcoming Armenia to Tallaght in September. The top two seeds, Italy and Sweden, complete Ireland’s group. Kenny’s cubs should have been ahead after only seven minutes when Idah scampered clear only to ripple his shot into the side-netting. Apart from Kenan Avdusinovic’s tame shot which was easily saved by Caoimhin Kelleher, Luxembourg created litte in the final third. Instead, Ireland got a foothold and soared ahead on 34 minutes. Neil Farrugia’s corner-kick was telegraphed perfectly for Idah to attack the near post and steer his header into the top corner. It wasn’t long before the visitors were dissected again. Man of the match Connor Ronan did the spadework by advancing at pace and his slide-rule pass was finished by Farrugia’s deft dink beyond the stranded goalkeeper. Ireland dominance continued after the break and a similar break by Ronan led to the third. Idah was the recipient this time, haring clear from the break and burying his low shot beneath Tom Ottele for the third. Jayson Molumby, who bossed the midfield alongside Conor Coventry, had earlier almost embarrassed the Luxembourg goalkeeper by attempting an audacious lob from 35 yards, which clattered off the crossbar. Ireland could have added more goals to their tally, with Ronan, Molumby and Zach Elbouzedi spurning chances. Kenny didn’t mind. His term is up and running with a flying start and there to watch the next generation were Mick McCarthy and his coaching staff, including Robbie Keane. Ireland: Caoimhin Kelleher (Liverpool); Lee O'Connor (Manchester United), Dara O'Shea (Exeter City), Conor Masterson (Liverpool), Darragh Leahy (Bohemians); Jayson Molumby (Brighton & Hove Albion), Conor Coventry (West Ham United); Zach Elbouzedi (Waterford), Connor Ronan (FC DAC 1904), Neil Farrugia (UCD); Adam Idah (Norwich City). Subs: Jamie Lennon (St. Patrick's Athletic) for Molumby (78 mins), Dan Mandroiu (Bohemians) for Ronan (86 mins), Brandon Kavanagh (Shamrock Rovers) for Farrugia, Michael O’Connor (Linfield) for Elbouzedi, Aaron Drinan (Waterford) for Idah (all 89 mins). Luxembourg: Tom Ottele; Eric Brandenburger, Ten Held, Pit Simon, Kevin D’Anzico; Luca Duriatti (Dylan Kuete 87), Clayton Duarte, Jan Ostrowski; Mathias Olesen (Loris Tinelli 69), Lucas Prudhomme, Kenan Avdusinovic (Yannick Schaus 62).